“Shortwave is crammed with ghostly voices, radio tuning sweeps, Morse code bleeps, crackles and pulses… Prepare to be captivated by mysterious numbers stations, disembodied wails, warbles and mangled snippets of exotic chatter drowned in a sea of cosmic static. The Output Chain selector harnesses eight combinations of speakers and microphones, ranging from full-range studio monitors and condenser mics through to nasty little 3-inch radio speakers and a wonderful old-school graphite mic (the same technology that powered the telephones of forty years ago). This is where you can take those full-range Sines and make them sound like they’re coming from a battered old Radio Shack receiver. 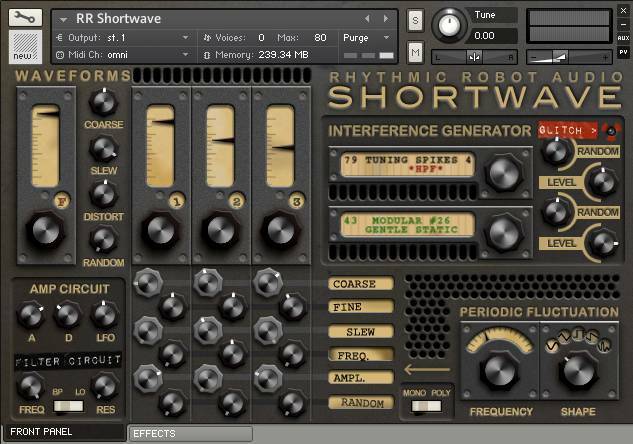 “Rhythmic Robot’s Shortwave is a Kontakt instrument crammed with ghostly voices, radio tuning sweeps, morse code bleeps and an assortment of hisses, crackles and pulses. Occupying a little over 250MB on your hard drive, this isn’t merely a collection of samples to work through and possibly tire of, but a tweakable synth built from four oscillators and two ‘interference generators’. It also happens to be one of RR’s more ‘out there’ creations, as demonstrated by its strange, ethereal and unearthly example patches. The four sine oscillators consist of a fundamental that can be pleasingly distorted, plus three tunable harmonics, their ratios unmarked on the panel to underline RR’s commitment to chaos. The oscillators are sampled from ‘unstable analogue sources’ but it’s the two interference generators that produce the more outlandish atmospherics. With 111 samples to pick from, these are noises harvested from the amazing sonic resource that is shortwave radio, with supporting samples taken from a modular synth. If you’ve never dallied in shortwave territory before, prepare to be captivated by mysterious number stations, disembodied wails, warbles and mangled snippets of exotic chatter drowned in a sea of cosmic static. Many of these noise sources could become energising backdrops for your otherwise pristine, in-the-box musical output. The interference samples are long — between 20 and 30 seconds each — and their playback points are randomised to crank up the unpredictability still further. Randomness is everywhere, from the progressive scrambling of oscillator pitch to a Glitch control acting as a one-click parameter scrambler. Glitch therefore generates new patches quicker than you can say ‘white noise’ and if the results don’t immediately grab you, a few more clicks should rustle up something with potential. The oscillators provide a convincing basis for drones and atonal pads thanks to dedicated randomising LFOs and a common modulation source with the funky name ‘Periodic Fluctuation’. Slew is another worthy contributor and it’s a term given two different meanings depending on where it appears. Its primary function is glide or portamento but when applied to the three individual harmonics, slew represents a ‘swoop down in pitch to the base frequency’ instead. The synthesis engine is completed by a basic but adequate two-stage envelope, plus a low-pass/band pass-filter. Built-in effects consist of an echo generator versatile enough to handle tightly resonant boings or conventional echo. There’s also a reverb unit with a custom convoluted plate. Interestingly, you can choose whether each effect is applied to the entire patch or to the sine wave components only. It can be particularly effective to set the various radio samples dry against a reverberant background wash — unless you\\\’re partial to unbridled slush, that is. Finally, the output section can be subjected to various simulated speaker and microphone combinations, starting with small, squeaky radio sets and graphite mics and working upwards in quality. Totally unique and one of my favorites. You get an instant Yankee Hotel Foxtrot feel once you place this on a track. Like nothing else I own. Shortwave is my first RR instrument. I can tell I’ve only seen the tip of the iceberg, but what this instrument can do is incredible. The ream of shortwave audio is indeed so mysterious and alien to our modern ears that it feels as if the instrument opens sonic portals. It makes me wonder what an RR instrument that applied the same approaches to a bank of one’s own samples would be capable of. And it makes me that much more excited to explore the other instruments they’ve created. The organic depth to the sounds produced is something that is rare and beautiful to find in any software instrument, but the way they allow for limitless (yet useful!) exploration via the Glitch switch is a game changer. I look ahead at the list of RR instruments I’m interested in here, and see how many of them also have a Glitch switch, and I become a little bit afraid. In the best possible way. Randomization is nothing new (though is used far too infrequently for the flood of choices we’re immersed in). But the way RR is so clearly dedicated to coaxing subtleties out of the sounds it creates instruments around is heartening and exciting. I know that ahead of me lie instruments for which multiple samples of seemingly the same tone or beat have been taken, and velocity added, to coax that much more richness out of the analog tones. But for now, Shortwave is a wonderful doorway into a deep and subtle world. Ever since Thomas Dolby’s “The Golden Age of Wireless”, I’ve been drawn to the combination of synths and shortwave radio. This instrument isn’t quite so blatant, but it definitely injects the feel of distant long wave broadcasts. If your aim is to suggest another place and time, without being overt about it, these sounds get you there. There’s always enough going on to keep your ears from getting overly familiar with the tones. Great colours for any audio soundscape. All the times I’ve browsed the RR pages, I’ve never even clicked on this one, thinking it was just sounds of tuning between radio channels, so I was pleasantly surprised when I checked it out and found out it was a strange “synth” (with radio sounds). It’s got one main sine tone, three more sine tones with pitch LFOs and two radio sound sources. Together they produce loads of weirdness and fun. Swapping one of the sine waves with a celeste sound also sounded magic (needed to switch the group to DFD because of scripted random sample start). As with quite a few other RR instruments, there are unfortunately two knobs that don’t work properly: The RANDOM knob for Interference wave 2 doesn’t do anything, and the Attack knob works for the pitch of the three 1st sine waves, but not the 4th one. We’ve had a close look, but can’t find the two issues you mention. As far as we can see, the Random knobs are all working properly (ie, introducing random fluctuation), and the Attack knob works as it should also. Could you drop me an email to check it through in more detail? Thanks! This is almost too out there – which is no mean feat compared to RR’s normal output. That said, I LOVE the sound of the number stations – instant crusty creepiness to any track! Looking to add background mystery to some tunes? Look no further! Thanks again RR! Absolutely crazy good. So inspiring. This is what makes making music fun. I have now embraced the accidental misfortune of having initiated a key interval with the precise MIDI data that played back the distinct sonic signature of a Mi-Go communicating with Clark Nova typewriter. I will report back later of their nefarious plans against NPR. There is nothing else like this. Even by RR’s standards it’s on the weird side! If you want out there, spooky, crusty, wonky and unearthly textures, you’ll find them pouring out of this thing! 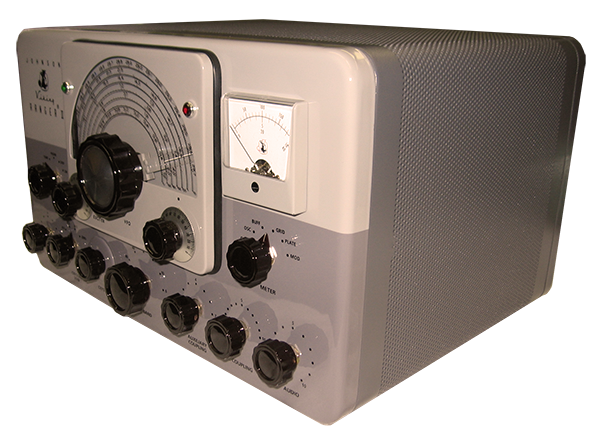 Great product, Shortwave is able to reproduce all sounds and noises of an old shortwave radio, with the advantage that this radio can sing… like a ghostly theremins quartet conducted by Mongo! Shortwave is no short on awesome sounds! It can be used by itself to create interesting sounds, or used in combination with other sound sources to add unique texture and overtones. I like being able to isolate the individual sound sources. 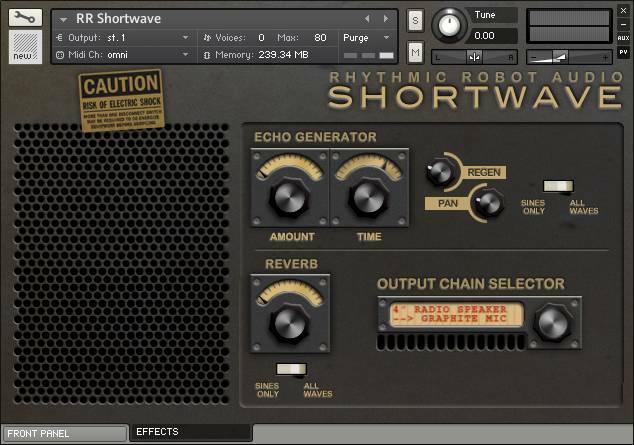 Shortwave is exactly what I was looking for (and more). Really wonderful sample content, along with retro radio-phonic style tweak-able synths… incredibly atmospheric stuff! I also really appreciate how configurable everything is, with mix controls the samples / synths all made independent, you can really hone the overall sound to your needs. This is the instrument that sold me on Rhythmic Robot — masterfully crafted stuff! This instrument leaps to life when you assign knobs on your MIDI controller to it, you can create beautiful evolving pads. If you like “Radio Cure” by Wilco, it’s right up your alley. You could probably make a whole album with nothing but Shortwave! Once I got some issues with PayPal credit dealt with (which are completely PayPal’s fault, and the Professor and Mongo helped as much as they could), I was immersed into a world of bwoops and garbled voices! Perfect for adding that touch of air to a track that’s missing some grit, or even as a foundation for a new sound thanks to the GLITCH button – a bolt of inspiration on demand. I also see a ton of possibilities with the faded out nature of the synth suggesting use as a counter melody – might just learn counter point to harness this potential. When I first saw this I couldn’t believe someone was making a plugin that was such a close fit for what I’d been looking for. I like spooky 60s style electronica/pop, and this is perfect for adding radio tuning sweeps and dynamic loops of static and mumbling voices for special effects, transitions and background ambience. Gives you a lot more flexibility and movement than just using individual samples because of all the blending options and parameters to tweak. As well as special effects and scary noises there’s also a lot of options for more traditionally synthy sounds that still have a unique character – the presets cover a lot of territory and give you an idea of how versatile it can be. The glitch feature is also a great way to explore what’s available and find something unexpected. If you’re looking for something spooky, atmospheric and very, very analog, Shortwave is definitely worth grabbing! Sometimes I just sit there and listen to the distant voices. It’s hard not to want all of the items in the RR catalogue, but if you have to choose I can easily say this is one of my favorites. The sounds instantly transport any listener into some other realms of the imagination. As time passes, I’m starting to realize that me and Rhythmic Robot are more and more developing a shared wallet. As soon as the monthly salary is in, I can’t help but surf my way to their site and look at which quirky instrument I’d like to buy next. The good news is, the pricing is always reasonable enough, so their library of instruments is actually something that I can afford exploring. And that exploring sure is a pleasant experience. The competition is tough, but Shortwave is the instrument of their’s that stands out the most in my eyes. Mind you, this isn’t an instrument that’s trying to be a jack of all trades. It’s obviously not going to fullfill all the roles in your production. It doesn’t want to. But, for the things it want’s to do, it does perfectly, and I’m finding it harder and harder to replace. Some obvious applications would be making gritty lo-fi pad textures and Boards of Canadesque leads. Other applications are purely related to sound design. In the right amount, Shortwave makes some great post-apocalyptic soundscapes fitting extremely well in video game worlds, and I can’t help but thinking of Fallout whenever I fire up Shortwave. And if you are short on inspiration in your music production endeavours, McDonald’s is of course hiring, but it might be more efficient and less dreamshattering to just fire up Shortwave and hit the Glitch button untill you find some sonic material to fall in love with, and your back on track. Buy this for you and for your friends, and then buy it a couple of times more. It’s that good. Seriously, do it now. I spent a portion of my childhood in the attic listening to my father’s shortwave radio, which I still inexplicably own despite its sorry state. Thank goodness for the Professor and Mongo having brought out this instrument. Just pressing one key takes me back to that warm glow and clear sense that there was something more ‘out there’. Musically beyond that, this is now my ‘room tone’ of choice for so many projects. Even at an almost subliminal level, this give any track that patina of age it could require. the first of a series of instruments I got from this site. yes, I bought several of them. need to say more? awesome instrument for example for adding a special atmosphere into a silent part of a song. wouldn’t want to miss it, now that I have it. This thing is great for adding disturbing but subtle background noise and unstable pads to tracks. The muffled samples of voices are my favourite, and I have to stop myself from putting them on everything. I’m working on a project where I need to create slow dreamy atmosphere and this thing is invaluable for that. Of course, the honored industrial music maker proudly personally samples old VHS or radio sources… … but for the moments when time is money, or just for an extra creativity boost, this thing is priceless for adding just the right kind of disturbing, unstable, odd background, no matter whether you´re working on an ambient track or follow the old school Skinny Puppy vein. I several times was looking for something handy like this. very customizeable, this is it. Unbelievably creative… Very cool, very interesting! This is one of my favourite Plugins so far. It’s really easy to dial in ambiences for a track or just use it as a noise source! Cool sound effects plucked from the ether. This was exactly what I was looking for for suspenseful, ambient background sounds and noises. I used it a bit on out latest album and plan to do so a lot more in the future.